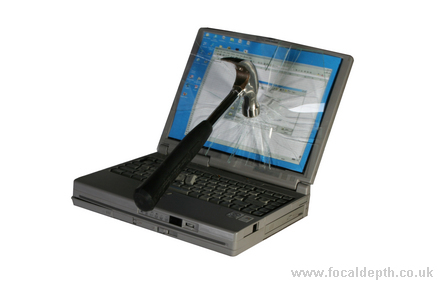 In a rage of furious anger following hours of frustration the user strikes the laptop computer screen with a hammer. It shatters into a thousand pieces. In reality a laptop screen does not shatter in this way. the image was captured by taping a piece of picture frame glass in front of the screen. The hammer was swung on a length of fishing line in total darkness. A sound triggered flash was used to record the moment of impact.